In New York City, you can discover something new and surprising every day! 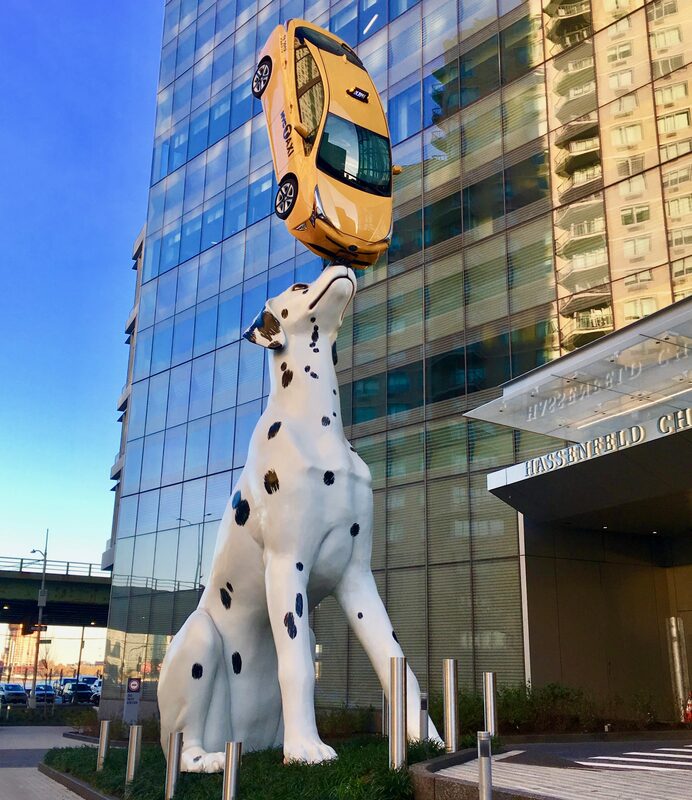 I was on my way to a party on East 34th Street near the FDR Drive when I found myself face to face with a 38-foot-tall statue of a Dalmatian balancing a bright Yellow NYC Cab on her nose. Yes, I just typed that. 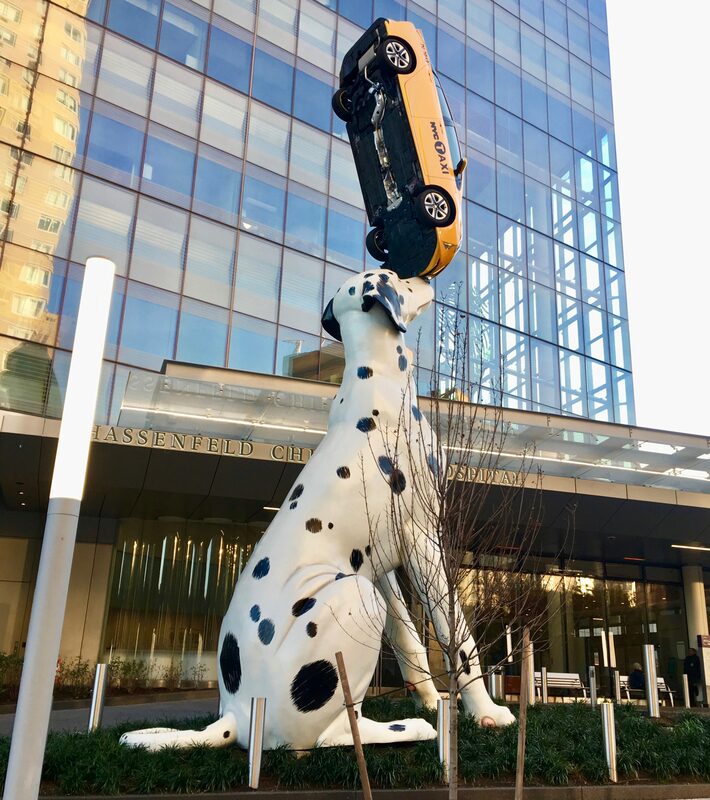 The site-specific sculpture of a female Dalmatian puppy called Spot is the work of artist Donald Lipski. 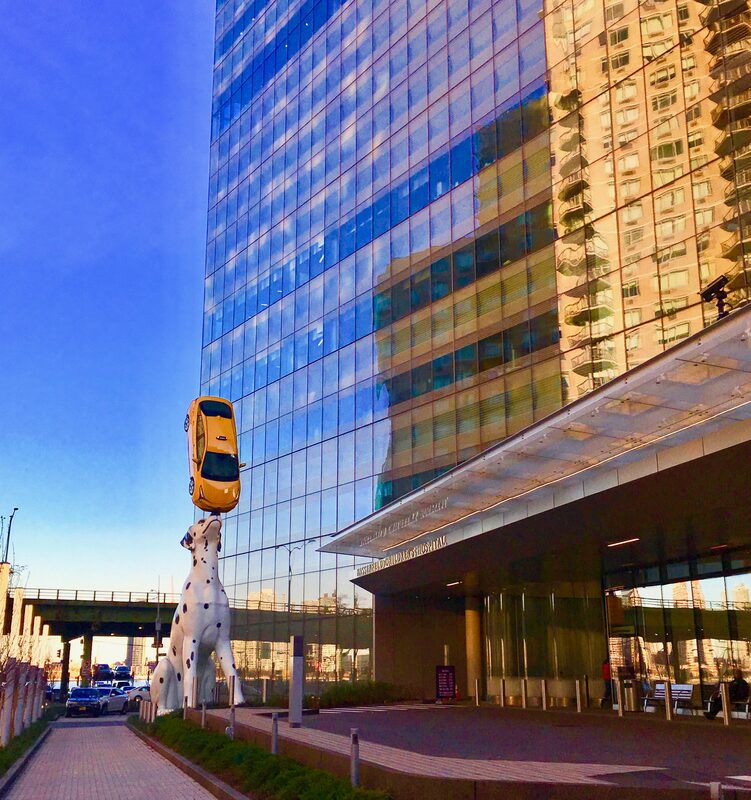 Rising to the height of a three-story building, Spot serves as a lighthearted greeting for patients of the new Hassenfeld Children’s Hospital at NYU Langone, which opened on June 24th, 2018. Spot was constructed with fiberglass and steel beams in a large factory in Wisconsin before she was trucked to the city, and brought in by crane to the 34th Street construction site. The taxi cab is a real Prius (sans motor) which was donated by Toyota. When it rains, its windshield wipers will activate. 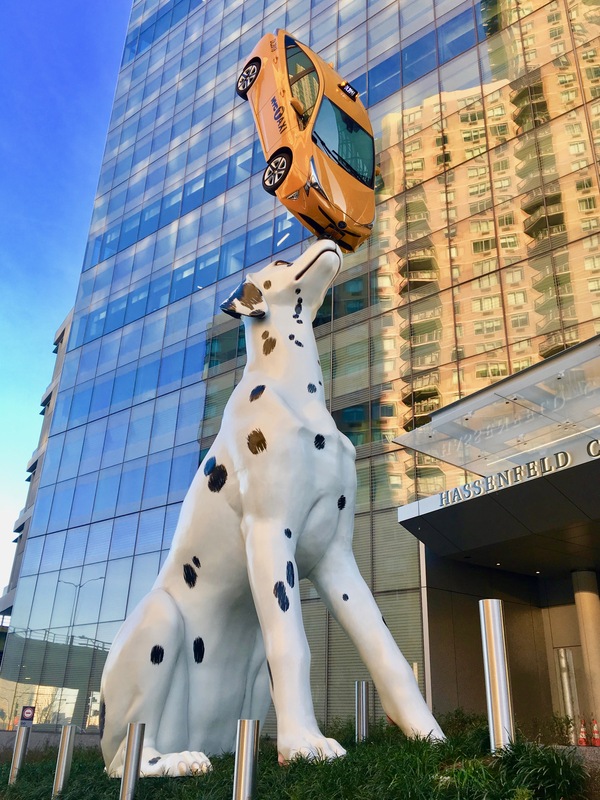 “Spot is the perfect playful figure to introduce adults and children to Hassenfeld,” NYU Langone said in a statement. “Spot contributes to the hospital’s uplifting atmosphere, part of our commitment to helping families feel welcome, supported and at ease from the moment they walk through the doors. 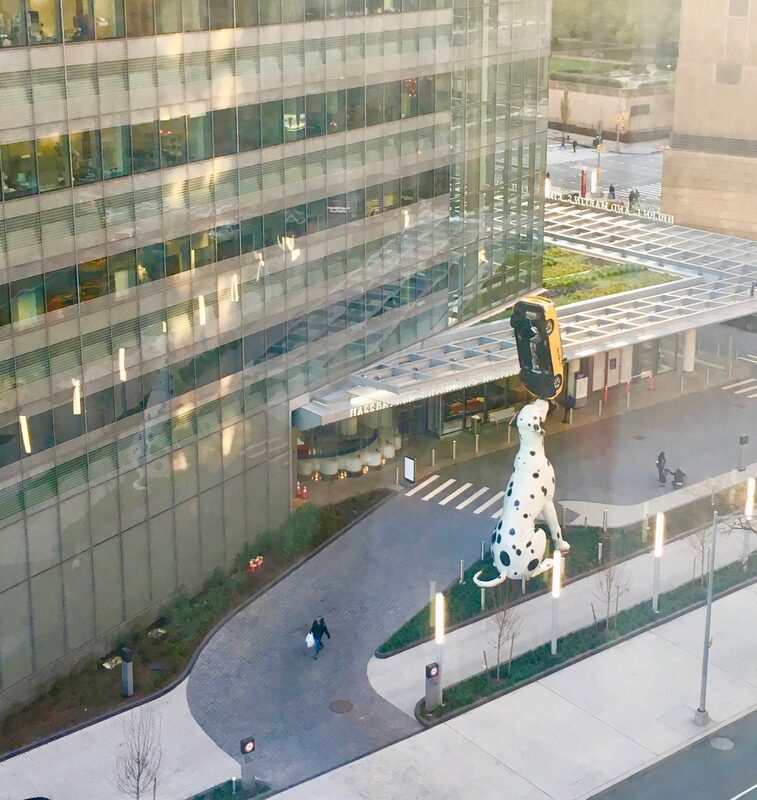 Spot Can Be ‘Spotted’ on the Strip of Lawn Just Out Front of Hassenfeld Children’s Hospital Entrance at NYU Langone Health, Located at 424 East 34th Street (East of First Avenue), NYC.